IT LOOKS LIKE SNOW IS FALLING FOR NOVEMBER! WITH THE SNOWFLAKE SHOWCASE ANYWAY! We don’t see Snowflakes in our warm Aussie Christmas. Snowflakes are so magical though. We can have that magic on some of our Christmas cards though. There is a special new release for November with the Snowflake Showcase. These contain gorgeous dies and beautiful stamps I think you will love. I will be focusing a lot with these on my blog and in classes during November. This Saturday is a Special Snowflakes class so if you are local come and capture some of magic with this suite. If you are in the Wollongong area come along and catch a snowflake. The details are below. If you can’t make it, check the KIT TO GO option further down. Here is a sneak of one of the cards we will be making. There will be 3 cards all together. COST: There are 2 different prices so check them closely. PLUS 1 sheet 6” x 12” White Velvet paper. 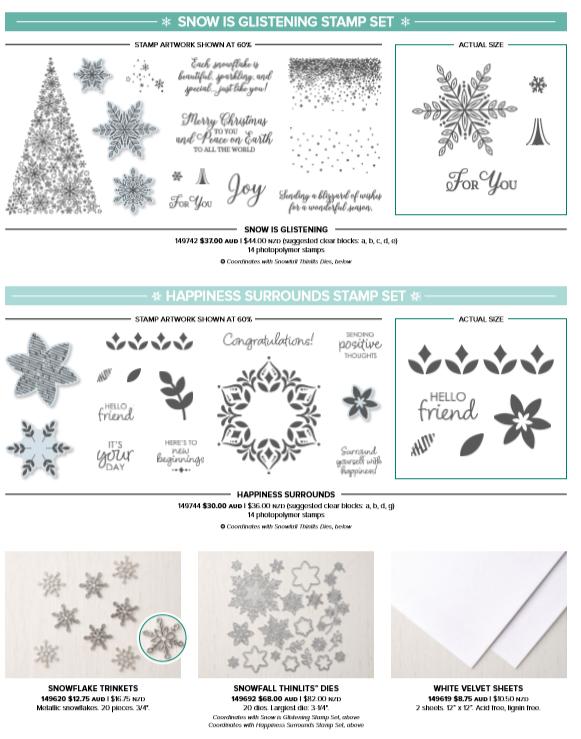 **ADD the Happiness Surrounds Stamp set for an additional $30 and receive the Snowflake Trinkets FREE (valued $12.75). Please RSVP Thursday 1st November. Please RSVP FOR THE CLASSES ASAP as it really helps me prepare the card kits for you AND to get in early to ensure you get a seat. These are the products which will be available ONLY in November. We will be using some of these gorgeous products in the class. 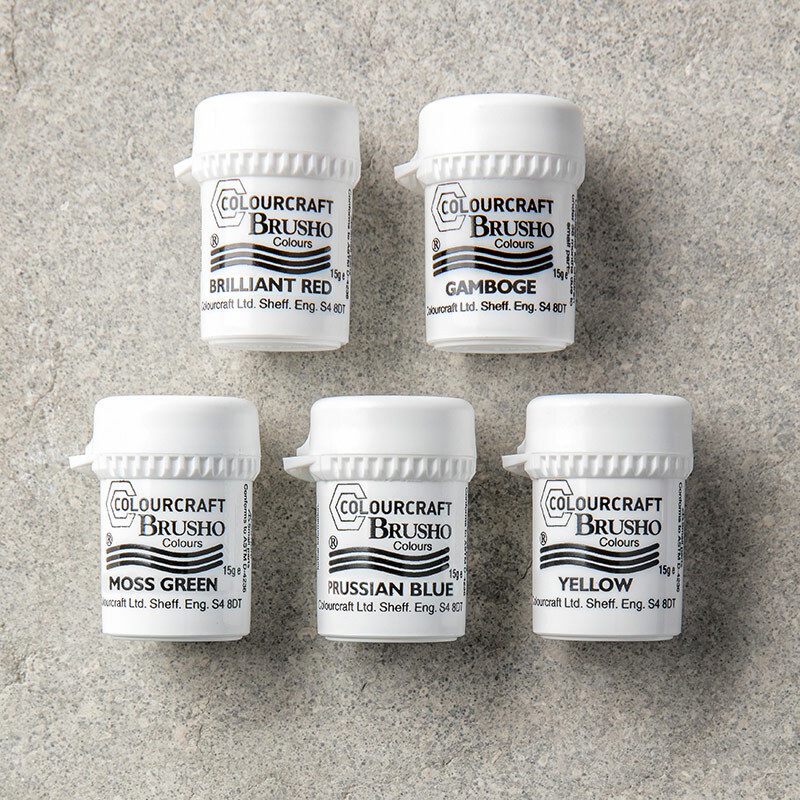 Watch out for lots of projects using these products over the next few weeks. Don’t feel you miss out if you can’t make it to the class. Grab the ‘Kit To Go’. Includes all card materials and instructions to make 2 cards when you order the Snow Is Falling Stamp set and the Snowfall Thinlits Plus receive 1 sheet 6″x12″ velvet paper. Add the Happiness Surrounds stamp set for $30 and you will also receive the Snowflake Trinkets for free. WANT TO ORDER THIS WEEK. (Australian residents only). Thank you in advance for your orders. I do appreciate them. Be sure to not mark your orders as anonymous online or I can’t send you out your Thank You card and gift. LEAPING DEER FOR A STAMP A STACK! There are lots of things happening to share with you at the moment with specials and extra bits. You really want to see inspiration though don’t you?? 🙂 I have a quick card to share with you today. This card was one of the cards we made at last week’s Christmas Stamp A Stack. Everyone loved the richness of it. There was a lot of cutting and embossing to it but once that was done the card came together quickly. Especially when they had 3 of these to make! The card base is Cherry Cobbler with the card mat embossed with the Swirls and Curls Embossing Folder. There was a bit of punching with the Sprig Punch in Old Olive and Shaded Spruce. The only stamping was the sentiment which is from the Wishing You Well set. Of course, the beautiful leaping deer from the Detailed Deer Thinlits. This card was inspired by one by Jo Anne -> HERE. 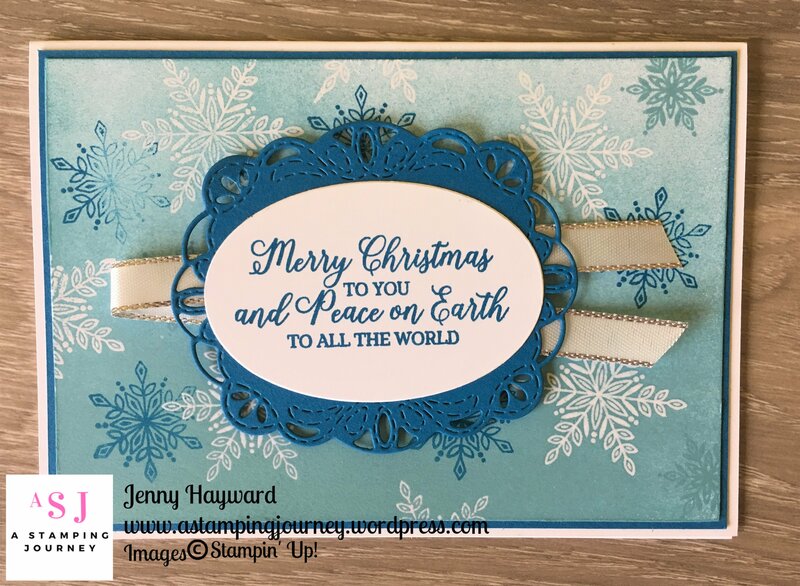 CHRISTMAS STAMP A STACK CLASSES START THIS WEEK! Get creating your Christmas cards now. Stamp A Stacks are a great way to create a number of cards at one time. You will create 6 cards at this class, 3 each of 2 designs. Here is a sneak of them. If you are a Wollongong Local come and join in. I would love to see you . Everyone is really lovely too. We have a fun time at these classes so don’t be too worried. Friday 21st September 10am or 7pm. Cost:$20 $5 extra to use my adhesives. BYO: Scissors and Adhesives. $5 extra to use my adhesives. Can’t make it? Why not grab the kit to go? Cost is $20. All card and embellishments are included but no stamped images. See all the amazing new colours along with the gorgeous new products at my ‘Colour Your World’ Catalogue Showcase. Places are filling fast. There are 3 time sessions. Tuesday 12th June – 7pm. WHERE: For local Wollongong people. Come and join in. RSVP: Wednesday 6th June or by Sunday 10th for the Tuesday session. I started making this sign before Christmas at a team meeting and as usual hadn’t finished it. I put it aside and actually forgot about it. When I was clearing up things the other week I found it and thought it must get finished. So yesterday, although it was Mother’s Day here I did get some time to indulge in a little creating for me and got about doing it. I thought you might like to see it. Nothing fancy but I thought it would be nice to hang in my studio to welcome all the lovely stampers that come along to classes. This is using the Eclipse technique with the Large Letters Framelits and the Touches of Texture. This is the length of an A4 sheet of white but I have cut the width to about 15cm (6″) I think. I backed the Whisper White card on some thick card from the Foil Sheets packaging we get and then backed that on some Silver Foil. I think I will add some sparkle with the Wink of Stella pen?? PETAL PALETTE TRIO CLASS ON THIS WEEK! The Petal Palette is a gorgeous bundle that I have recently started playing with. We will be focusing on this set in class this week. I have added an additional time so hopefully you can come. 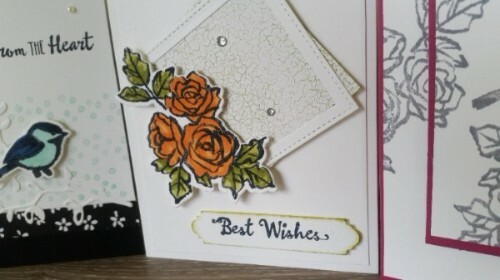 Create 3 beautiful cards using the gorgeous Petal Palette set. These cards were inspired by some lovely cards I found on Pinterest. Class details: Do check for the additional class time added. Tuesday 17th April 7pm RSVP: Sunday 15th. **WEEKEND SPECIAL: Order the Petal Palette Bundle (CM $108) and receive 20% off COST = $86.40 + Shipping ($5.40) TOTAL = $91.80. Discount available for Wood mount as well. Orders can only be made directly through me not online. BRUSHO FUN IN CLASS THIS WEEK! I have been having lots of fun playing with the Brusho Crystal Colours lately. I will show you some of the projects over the next week or 2 but today I want to tell you about this week’s class for the local Peeps. And I have a special offer for the Brushos this week whether you come to the class or not. The Brusho Crystal Colours are magical to work with. Just add water and you have incredible backgrounds and colours. This weekend’s class we will be creating magic. These are the 2 cards we will make. Along with these 2 fun cards we are making we will try out a few more ways to use them. All materials included. Bring your own scissors and adhesives. WHERE: East Corrimal. (address given when you reply). For next weekend only (available if you come to the class or not) Receive 15% off the price. RRP is $52 Take off $7.80 Weekend price = $44.20 (+S&H). This is for Australian residents only. Special not available in store. Contact me directly. Places are limited for class so let me know ASAP. SEE THE NEW COLOURS, HAVE FUN CREATING! IT’S ALL PART OF MY OPEN HOUSE! Bring a friend with you or if you can’t come why not pass the invite on to a friend. The more the merrier! The details are below. Please reply early as seats book out very quickly. EASTER GIFT CLASS THIS FRIDAY! Easter is less than 2 weeks. Yikes! Better get some gift packaging ready. Class this Friday will help you get some sorted. Come along if you are in the Wollongong area. We will be making a gift box ready to fill, a treat holder which includes a mini Lindt bunny and also 2 tags that you can add to your own store-bought Easter treats. Cost: $20. Includes all materials and mini Lindt Bunny. Please RSVP: Thursday 6th April. Let me know ASAP to reserve your seat. I am sure you have seen the new catalogues by now?? Well if you are a Wollongong local why not come and play? includes a card to make, play with new products, giveaways and afternoon tea. Please RSVP by Wednesday 1st.